United Nations Security Council Resolution 425, adopted on March 19, 1978, five days after the Israeli invasion of Lebanon, called on Israel to withdraw immediately its forces from Lebanon and established the United Nations Interim Force In Lebanon (UNIFIL). It was adopted by 12 votes to none; Czechoslovakia and the Soviet Union abstained, and China did not participate. U.N. Security Council Resolution 425 was issued five days after the Israeli invasion of Lebanon on March 14, 1978, in what was referred to as Operation Litani. The stated objective of the Operation Litani was to clear out the PLO bases located inside Lebanon, south of the Litani River, in order to better secure northern Israel. Following Lebanese government claims, the United Nations, driven by the United States, began seeking a peacekeeping force for the area that Israel had occupied in order to bring about a withdrawal of the Israeli forces, and to reintroduce the authority of the Lebanese government in southern Lebanon. These efforts culminated in Resolution 425, during the 2074th meeting of the United Nations Security Council on March 19, 1978. That led to the formation of UNIFIL, the objective of which was to confirm Israeli withdrawal from Lebanon, restore international peace and security, and help the Lebanese Government restore its effective authority in the area. Requests the Secretary-General to report to the Council within twenty-four hours on the implementation of the present resolution. The first UNIFIL troops arrived in Lebanon on March 23, 1978, just four days after the resolution was passed. Israel withdrew its forces by June. Later, Israel expanded its occupation in a larger-scale invasion in June 1982, in which Israeli troops occupied the capital city of Beirut -- See 1982 Lebanon War. Other major attacks within Lebanon took place in July 1993 and April 1996—See Operation Accountability and Operation Grapes of Wrath. 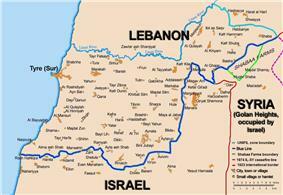 In May 2000, more than 22 years after resolution 425 was passed, Israel withdrew its troops from southern Lebanon. Prior to the withdrawal, opposition voices inside Israel pressured the government to withdraw from Lebanon, as they saw no valid reason to stay there and sustain Lebanese attacks. The UN Secretary-General concluded that, as of June 16, 2000, Israel had indeed withdrawn its forces from Lebanon, in accordance with resolution 425 (1978). The border recognized by the UN is known as the "Blue Line". Lebanon, however, claims that Israel is still keeping Lebanese land under its occupation, mainly in Shebaa Farms. Israel says, and the UN agrees, that Shebaa Farms is Syrian and not Lebanese, and therefore it is not included under resolution 425. Lebanon has not extended control over south Lebanon, though it was called on to do so by UN Resolution 1391 of 2002 and urged by UN Resolution 1496 of 2003. Israel has lodged multiple complaints regarding Lebanon's conduct. Immediately after the withdrawal, Israeli aircraft crossed the Blue Line on an almost daily basis, penetrating deep into Lebanese airspace. Since mid-December 2005, the number of Israeli air violations has decreased. Israeli warships also continued to violate the Lebanese territorial waters. On October 22, 2005 a Lebanese fisherman was reported missing. His boat ran aground in Israel, and was returned by the Israeli army. There were a number of bullet marks on the boat. The IDF explained that they had opened fire as a precaution in case the boat was booby-trapped, but that it was already empty at the time. Many other incidents were reported along the Blue Line such as gunfire and cross border attacks. Both Lebanon and Israel have lodged multiple complaints regarding the other party's violations. Hezbollah, a Shiite group which exercises de facto sovereignty over much of South Lebanon, rejected Resolution 425 and continues to launch attacks against Israeli troops from time to time, primarily inside the Shebaa Farms area. Lebanon also calls on Israel to free the prisoners of war and to hand over the maps of the land mines in the area that was under its occupation. On October 7, 2000, three Israeli soldiers – Adi Avitan, Staff Sgt. Benyamin Avraham, and Staff Sgt. Omar Sawaidwere – were captured by Hezbollah across the Israeli-Lebanese border. The soldiers were killed either during the attack or in its immediate aftermath. In the context of this long history of incursions over the Lebanese/Israeli border by both Hezbollah and IDF forcesbegan, Hezbollah fighters fired rockets at into Israel. Of the seven Israeli soldiers in the two jeeps, two were wounded, three were killed, and two were captured and taken to Lebanon. Five more were killed in a failed Israeli rescue attempt. Israel responded with massive airstrikes and artillery fire on targets in Lebanon that damaged Lebanese civilian infrastructure (including Beirut's Rafic Hariri International Airport which Israel alleged that Hezbollah used to import weapons), an air and naval blockade, and a ground invasion of southern Lebanon. Hezbollah then launched more rockets into northern Israel and engaged the Israel Defense Forces (IDF) in guerrilla warfare from hardened positions. ^ Saad-Ghorayeb, Amal. Hizbu'llah: Politics and Religion. London: Pluto Press, 2002. p. 154. ^ a b New York Times via the International Herald Tribune (July 12, 2006). "Clashes spread to Lebanon as Hezbollah raids Israel". Retrieved August 16, 2007.